4 ounces firm white fish, rockfish, seabass etc. TO PREPARE THE MOUSSE: Remove any bones or skin that might remain on the fish. Cut the fish into 1 - inch pieces and place in the bowl of a food processor. Purée the fish in the food processor fitted with a steel blade. With the processor running, add the egg and process until the egg is completely blended into the fish. Slowly pour in the heavy cream (with the machine running) until all is completely incorporated. Add remaining ingredients and give the mousse a final spin to blend. Poach a small amount of the mousse in lightly salted water and taste. Adjust seasonings, if necessary. Chill mousse completely. Separate the claws from the body and split the body in half lengthwise. Remove the meat from the lobster by cracking the claws and pulling out the tail meat. Cut all the meat into bite-sized pieces. If not using immediately, store the lobster meat in some cooled broth and refrigerate. Rinse the lobster shells halves under cold water and drain well. Reserve shells. TO PREPARE THE HERB BEURRE BLANC: Dice the butter and reserve in the refrigerator. Combine the wine, vinegar, and shallots in a small saucepan and boil down, until almost dry. Reduce the heat to the lowest setting. Whisk in the chilled butter, several pieces at a time. Whisk constantly until all the butter has been incorporated into the sauce and remove from heat. Stir in the finely chopped herbs. The sauce should have the consistency and appearance of a light hollandaise. TO ASSEMBLE THE SOUFFLÉS: Preheat oven to 400 degrees. 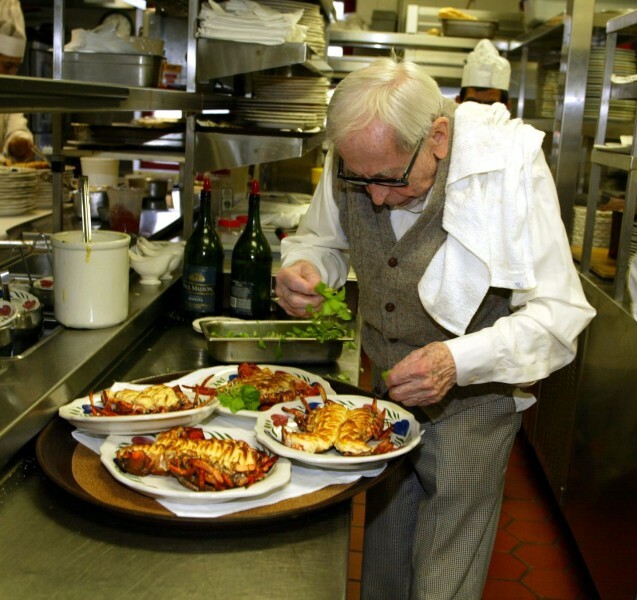 Up to 1 hour before serving, divide the prepared lobster meat between the split lobster halves, filling head and tail. With the aid of a small spatula, cover the lobster meat with the mousse, approximately 1/2 inch thick. Place the prepared lobster halves on a small sheet pan. Bake in the preheated oven for about 10 - 12 minutes until the mousse is golden brown. Serve immediately with Herb Beurre Blanc.